English is not only beneficial but also the time period of learning English gives you a lot of satisfaction. Making progress feels great and closer to perfection. Learning another language means becoming a another person, so lets explore yourself. 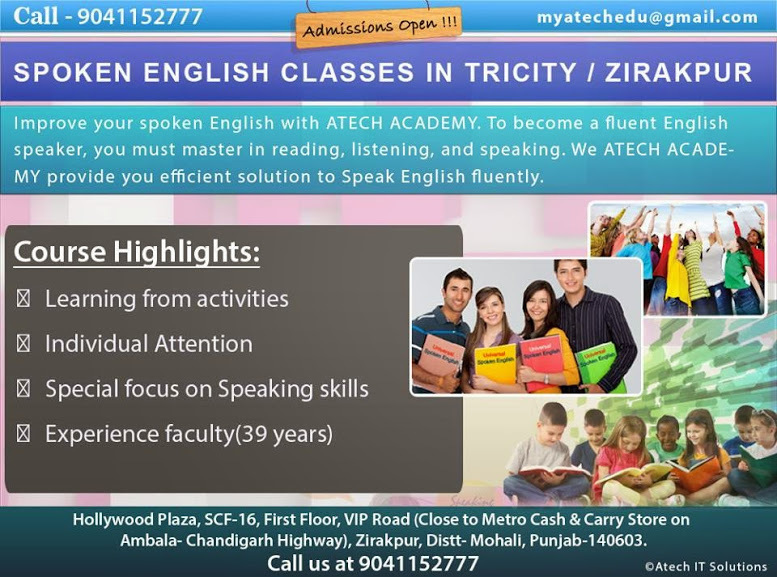 Atech Excel Solution offers spoken English classes to all the Students, Professionals & Housewives. English may not be the most spoken language in the world, but it is the official language in most of the countries. It is an estimate that the number of people in the world, who use in English to communicate on a regular basis is around 2 billion. One out of 5 people can speak or understand English! English is also the language of the Internet. Knowing English increases your chances of getting a good job in a multinational company within your home country or work abroad. Atech Excel Solution teaches many students every year, which means we understand the needs of our students and supports them in every possible way to face challenges of life. We always have an aim to provide an environment which is full of creativity and knowledge because this is truly said that if any candidate enjoys his class, He is more motivated to progress towards his studies. Enrol now for the right course and get trained from our professional teachers who hold recognised qualifications in teaching English and are experts of their respective field. Our study material helps you to gain practical experience and skills to enhance your English language abilities. (A)General English: - This is an interactive course, delivered by our professional teacher, which helps to improve your fluency, accuracy and confidence in English. In this course, you will learn through a combination of live classes and other valuable activities. You will be able to improve your English communication skills in a very flexible and interactive way and will learn how to interact in real-life situations. Helps to improve pronunciation, grammar and vocabulary. (B) Professional English:- These courses are provided at a range of different levels along with Personality Development and are structured to improve your overall English Language in its four major skills - speaking, listening, reading and writing. You will enhance your level of communication in a proficient manner. You will also develop your ability to use English grammar, pronunciation and vocabulary with confidence and accuracy. Development in personality helps to fight with public speaking fear, boost up confidence and reduce anxiety level. You will become more confident in social situations and move ahead in career smoothly. Helps to increase your fluency and listening skills with people.